This module is a part of our 300-hour teacher training in Portugal, but can also be attended as a workshop. It’s open to yoga teachers who would like to learn more about body-centred psychology and how to recognise certain patterns and reactions in their students as well as psychotherapists who would like to learn more about the yoga tools they can use in their sessions. All our life experiences take part in structuring and shaping our Body-Mind Field. Especially painful or traumatic situations, that could not be resolved, still reside deep in our system. As a Yoga practitioner you most likely have experienced a sudden release of emotions during or after Yoga practice - this can range from sadness and tears coming ‘out of nowhere”, to agitation, anxiety, anger, fear or regression into sensitive early developmental moments. This can happen with many more body-mind stimulating practices, because some protection patterns are challenged, or with advanced Asana practices, overheating the body-mind with a fast paced practice, intensive Pranayama, some visualization and meditation practices, etc.. In Yoga we often see this as an involuntary release, which can be to an extend beneficial for some, however, for others it can lead to a physical and emotional imbalance or dis-regulation. This is why some yogic practices are called advanced and were traditionally only taught by an experienced teacher individually to a student. Yoga teachers are often not trained in psychotherapy, but with some basic knowledge of Somatic Awareness and Core Evolution you can notice certain patters in your own Body-Mind Field and later also in your student’s. Nina will teach different Yoga sequences and techniques and, as we see, what may emerge on the personal level - and different to normal sessions, we will give room to process and integrate this emerging material, leading to a conscious way to resolve stress and promote Auto- and Self-Regulation. In the practice of Somatic Awareness and Core Evolution with Siegmar, you will learn about specific protective reaction patterns and how they may get triggered in your life. These patterns are specific coping mechanisms that you chose to meet difficult life situations. They may range from energetic withdrawal to overcompensation. To protect your vulnerable essence it was important to develop them, however, these trigger-reaction patterns may not be adequate anymore for who you really are today. In this Yoga-Training unit you learn to choose practices that enable you to stay connected and to enjoy and share your presence and expression of life in you, which will promote healing and self-regulation. 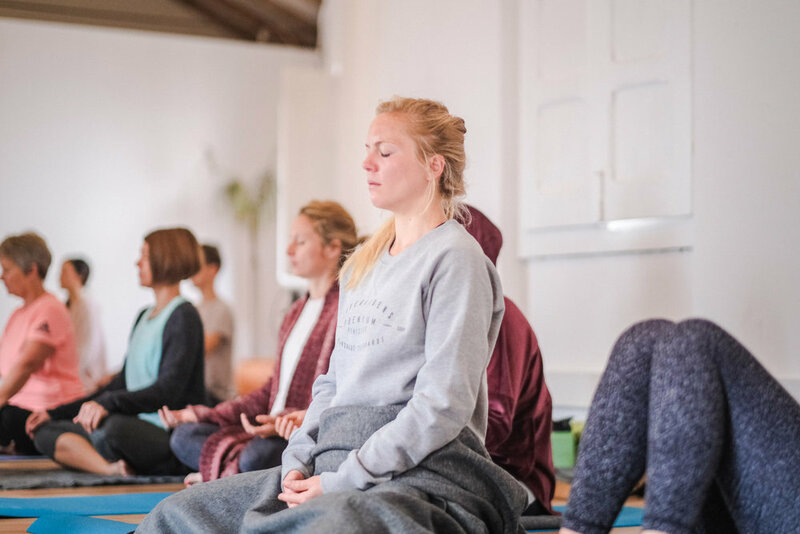 *This module can be attended by yoga teachers of any lineage who would like to learn more about the application of Somatic Awareness in Yoga as well as Body - orientated psychotherapists who would like to learn yogic techniques designed to further help their clients. Perched atop of 30-metre sandstone cliffs, overlooking the powerful blue Atlantic, and a string of golden sand beaches, lies Ericeira, a fishing town in Lisbon district, about 35 kilometres northwest of Lisbon. The old village is charming and typically Portuguese with whitewashed houses, blue doors and window frames, tiles, chapels and narrow cobbled streets. Our venue, Olive3 yoga retreat centre, is conveniently nestled in the old village, within walking distance from the beaches, shops and restaurants, but tucked away enough to allow peace and quiet. You will find it almost hidden behind three olive trees (hence the name!) and Fonte do Cabo, an old fountain dating from 1457. which makes it one of the oldest fountains in Ericeira. With simple but charming and comfortable rooms, big garden featuring a small pool, large communal kitchen and a beautiful, bright yoga shala, Olive 3 is a perfect place teacher training/ workshop venue. EB 1100 € / LB 1400 € triple dorm room - SOLD OUT!